Toad Data Point v4.2 is now available! Today we are releasing Toad Data Point 4.2 and Toad Intelligence Central 3.3. I am really excited about these releases because they bring some great new features to our products that were originally requested by Toad Data Point users who were coming off of using Brio/Hyperion. Getting feedback directly from our users and having them influence new additions to the products is always a good thing! I encourage you to spend five minutes understanding each of these new features as I think they may truly bring more value into your Toad Data Point experience. 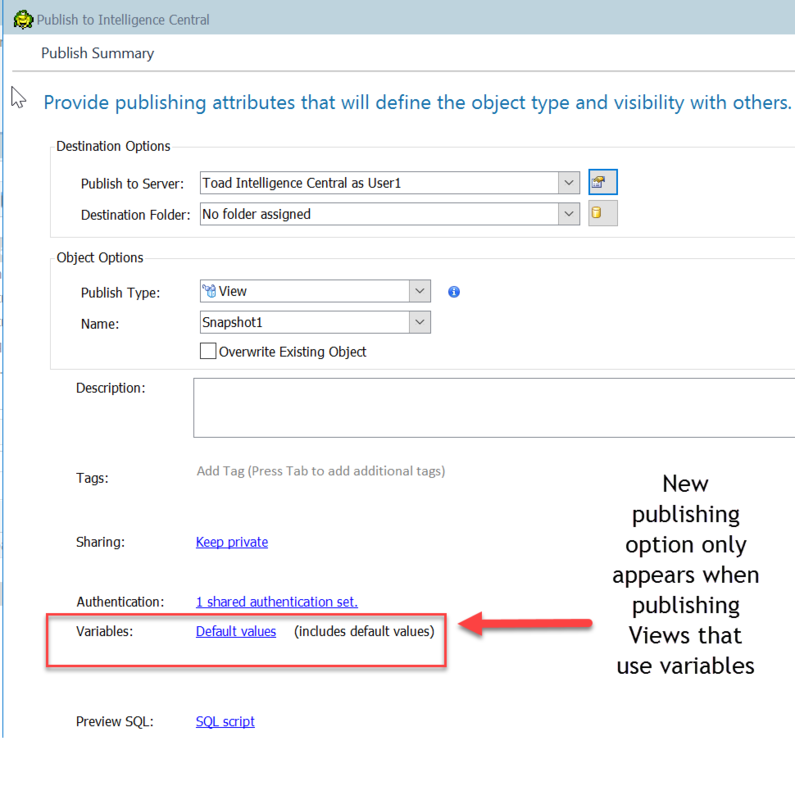 Toad Data Point Professional now supports publishing views to Toad Intelligence Central that utilize variables. This new feature allows Toad Data Point users to include variables in a published view so data consumers utilizing the Toad Intelligence Central web front end can change the value prior to retrieving the result set. (Note: You will need Toad Data Point 4.2 and Toad Intelligence Central 3.3 to get this new feature). 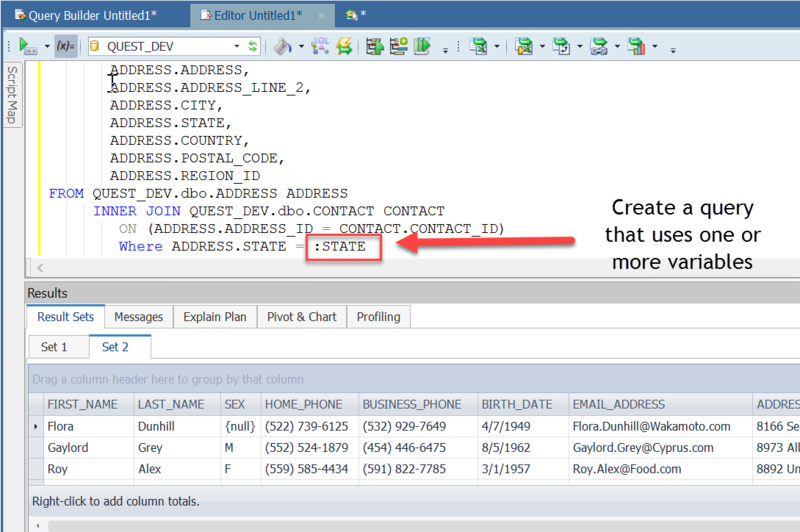 To use this feature, you will first need to create a query that uses one or more variables. 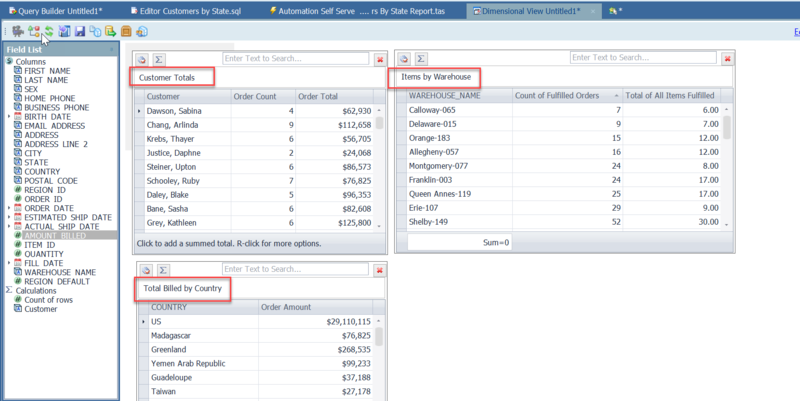 In this example, I am creating a simple Customer Report and adding a variable to filter customers by State. Once I have the query the way I want it, I publish the data to Toad Intelligence Central as a view (r-mouse click > Send To > Publish Data). 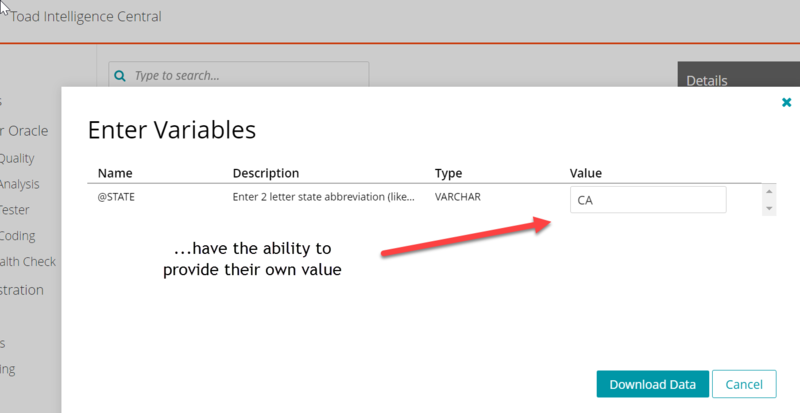 On the publishing screen you will see a new option called “Variables” when you choose to publish as a View and your query contains variables. 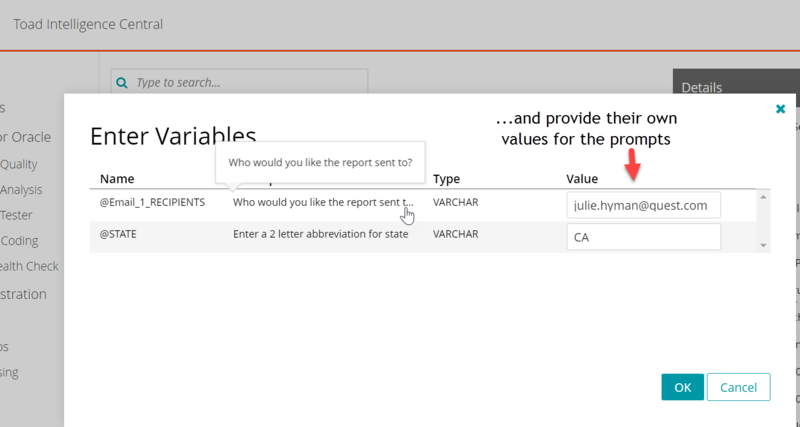 In this new option area you can define the description of any variable you have in your view as well as a default value. I enter a short description describing my variable and a default value of ‘CA’ for California. Similar to how you can now publish Views that use variables, you can now publish Automations that use variables as well. 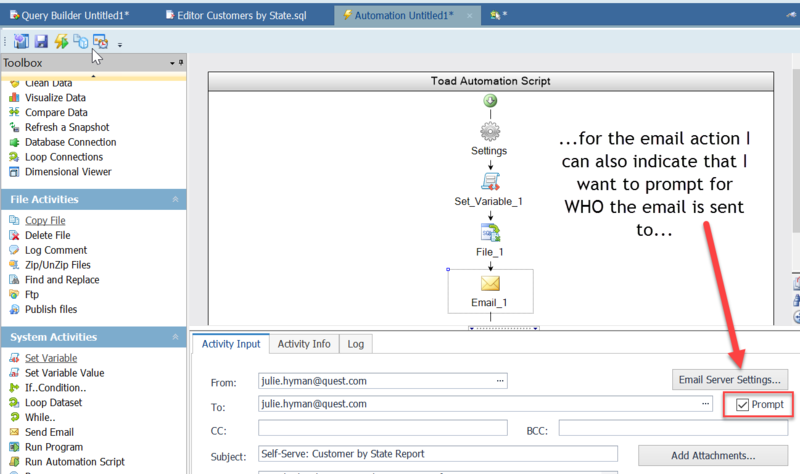 As a result, your Toad Intelligence Central users can kick-off automations through the Toad Intelligence Central web front end and supply values for those variables at run time. In the example below, I will use the same query I wrote before, but instead of publishing as a View, I will design a quick automation that exports the data to an Excel workbook, and then emails the workbook to my users. First, I create the automation that queries the data and then emails that data in an Excel workbook. 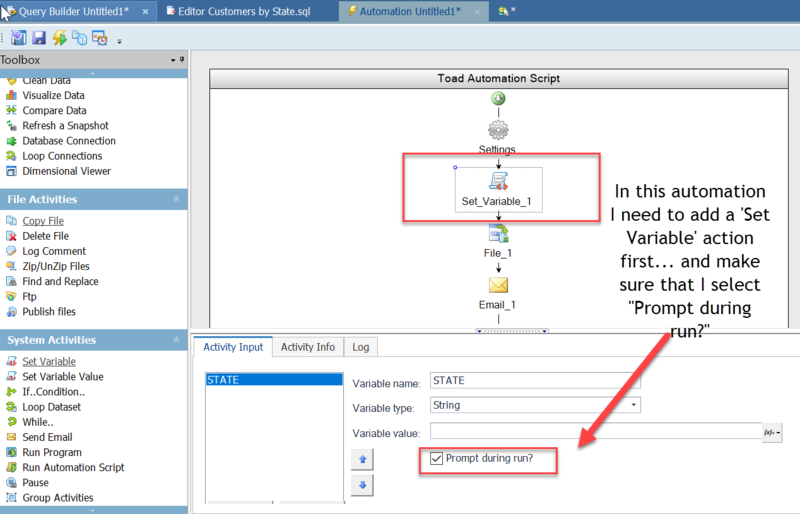 I add a ‘Set Variable’ step since I am using a variable in my query. For this ‘Set Variable’ action I make sure that I indicate that I want the user to be prompted at run time. Next I edit the ‘Email’ action to indicate that I also want to be prompted for the email recipient list at run time. 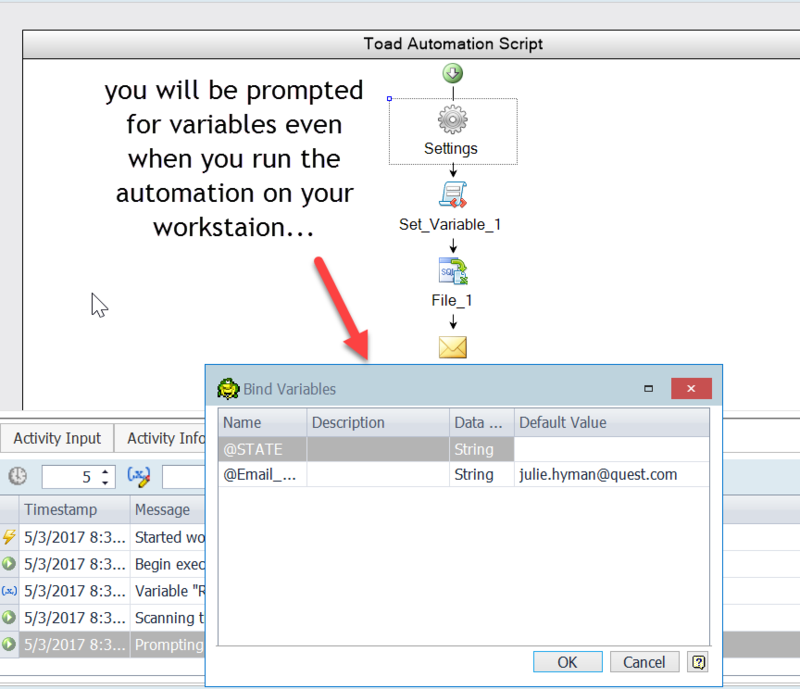 Now when I run this automation on my workstation, I can see that I will get prompted for two variables – the state value and who the report should be emailed to. With this working I am ready to publish. During publishing I have to provide variable defaults and I can also provide good descriptions of the variables. ...And provide their own values for the variables at run time. We have had Dimensional Views in Toad Data Point for a few releases, but it lacked good exporting and publishing options. In this release, it is easy to take the containers you create in the dimensional viewer and create a multi-tabbed Excel workbook or publish them as multiple data sets to Toad Intelligence Central. And, of course, all of those actions can be easily automated so you can continually refresh those data sets! 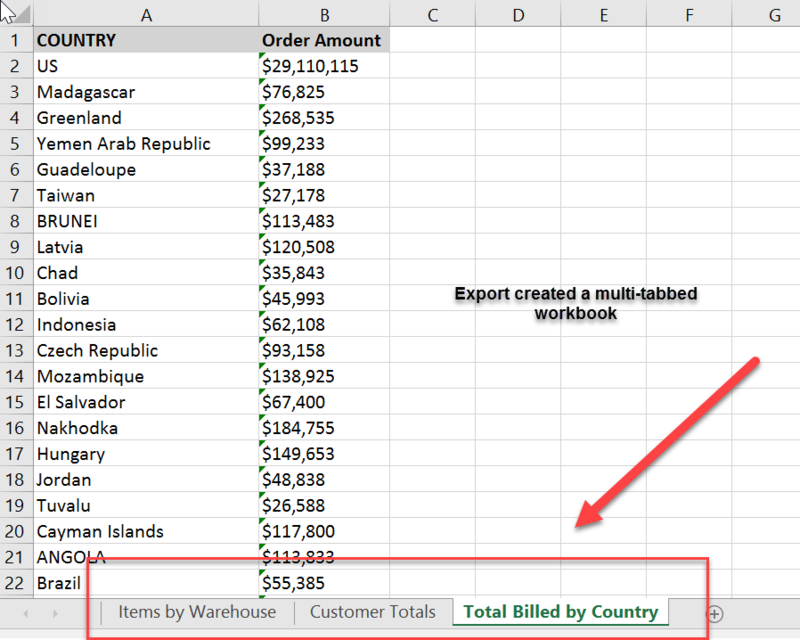 In the following example, I have created a Dimensional View from a basic order query, and then developed fhree containers within that view – one that shows order totals by customer, one that shows order totals by my warehouses and one that shows order totals by country. 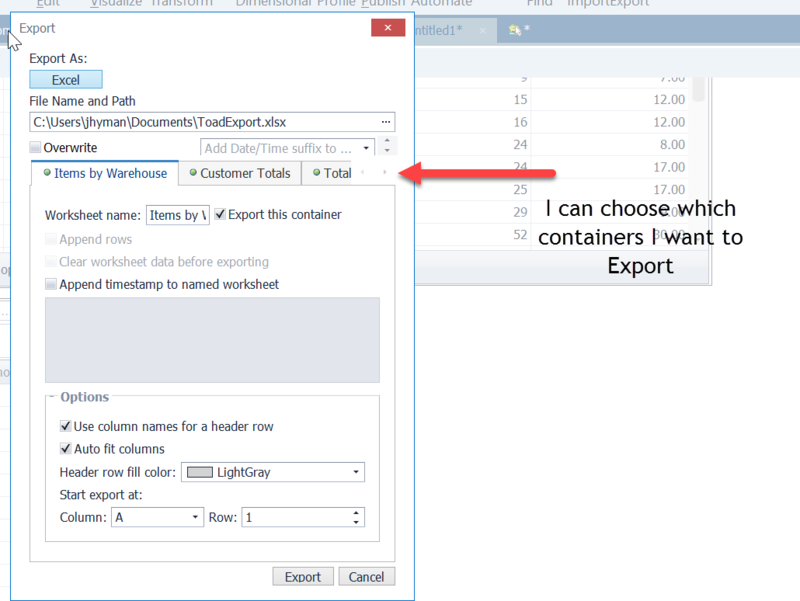 To create a single Excel workbook that contains all of these summaries, I can choose ‘Export All’ from the bottom toolbar. The pop-up dialog then allows me to choose which containers I would like to export and various settings for each of those containers. The end result will be a single multi-tabbed Excel workbook of my data. Similar to how I can export all of my dimensional containers in a single click, I can now publish all of my dimensional containers as data sets to Toad Intelligence Central in a single publishing action. ...I can select ‘Publish Details’ from the Publishing wizard. I can choose which containers I want to export and what I want to call them. And when I publish, all of these data sets are now available in Toad Intelligence Central through the web interface (or any third-party tool that can connect to Toad Intelligence Central through ODBC). I can also create an automation that automatically refreshes these data set as often as I need. Or that I can publish so that others can refresh when they need. 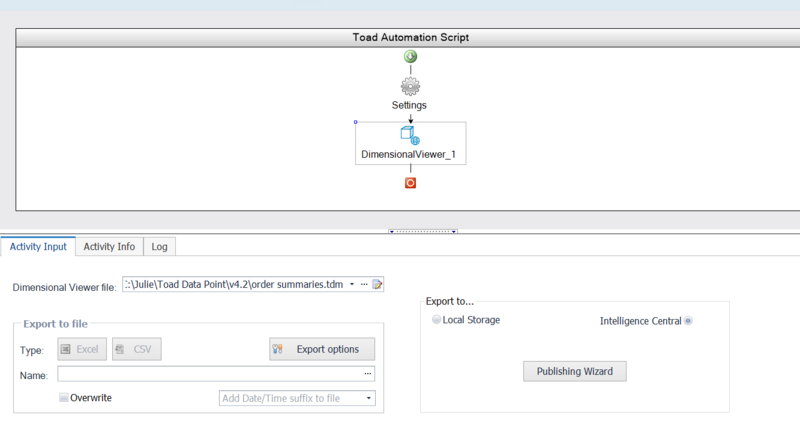 This blog covers just some of the major enhancements in Toad Data Point 4.2. But Toad Data Point 4.2 has other great new enhancements. To check out all of them review our “What’s new in Toad Data Point 4.2” document.